Did you know that the colour of your in-ground swimming pool can create a look all of its own? It can add in an instant *vibe* to your pool area; your in-ground swimming pool can look and feel like a crystal clear blue lagoon, or a sandy beach oasis. The pools of today no longer come in just one colour option, so you have the freedom to choose not only the swimming pool size and shape that suits your yard but the colour that suits your theme. Coloured pool designs look beautiful and are stunning when filled with water. Colours are utilised to give your pool a unique look and feel, and you really will feel like you are swimming in the beautiful turquoise waters of the Caribbean or a stunning blue lagoon in Turkey. Blue – a shimmering blue will give your pool a great deep blue colour while giving your pool a sleek look and feel. Grey – a grey mixed with a little blue makes your pool look clear and blue just like the waters in the Caribbean. Sand colour – these colours look like the sand on a beach, and with a shimmery light tan you can give your pool a tropical look and feel. Pale blues – this enhances the blue colour of your pool, so you’ll feel like you are swimming in the ocean. 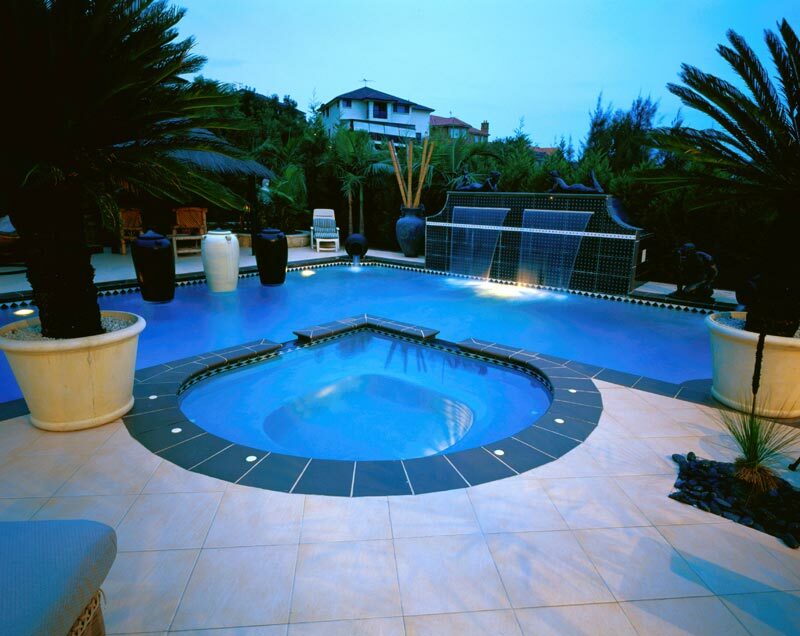 Aquamarine colours again give your pool the look and feel of the Caribbean. Stunning Sapphire blue shades matches closely to the more traditional tone of an inground swimming pool, but with a touch of sparkle that can set it apart from your neighbour’s pool. It can certainly be a difficult decision choosing the right colour for your new pool. You need to take into account the SIZE of your pool, as some darker shades can make your pool look and feel small and closed in, while lighter colours open up a whole new look and feel. What look, or feel are you hoping to achieve with your new pool? Remember a colour that’s popular today, might not be in fashion tomorrow – do you want your pool to be a tropical oasis? A natural lagoon? Or just a modern outdoor space? Look at the style and colour of your home when choosing a pool colour, the theme of your current yard will guide you towards the right colour palette for your pool. Depending on the size of the swimming pool you have chosen you may want your pool to be the centrepiece of your yard, you may want it to complement its surroundings, but also be a focal point, a place to add some *wow*. When choosing a colour for your pool include your: backyard theme, water reflection, water temperature and the pool surroundings. You want the process of selecting your pool to be simple and enjoyable, always work closely with your pool designer for the best results.